Charming city centre luxury apartment situated in this historic award winning brewery conversion. The wonderful high ceilings and large windows give the apartment a real sense of space and light. The master bedroom has an en-suite shower room, TV and king size bed. The twin bedroom on the mezzanine floor is served by the bathroom in the entrance hallway. A stylish kitchen and dining area leads to the delightful living space with TV, radio /audio system, telephone and ample seating on comfy sofas. With only the shortest of strolls to the Minster, the apartment couldn't be better placed for all the culture, entertainment, museums, restaurants and cafes that York has to offer. There is secure courtyard parking for one car. Complimentary welcome hamper of local produce on arrival. Thank you for taking the trouble to post a review. We're delighted you enjoyed your 1st stay with us and hope you will return in the future. We are returning clients, but this was our first visit to York Brew House. As expected the apartment was first class. Excellent location in York, quiet area but easy access into the centre. We parked the car in the allotted parking spot on site and it remained there until we left. Highly recommend to anyone wanting to visit York as independent travelers. Thank you for your kind review. We're delighted you enjoyed our York apartment as much as our cottages here on the coast. This was our first Christmas in York but our third in properties owned by John and Angela. The apartment was as we expected, of a very high standard, comfortable and well equipped. On a par with the excellent High Barn near Sewerby. The welcome pack was full of high quality goods and the Christmas tree added to the lovely atmosphere. John called us to check all was ok, much appreciated. The location in the centre of york with parking, which is at a premium in this city, is fantastic for just stepping out and exploring all the sites. I would particularly recommend the brew house to first time visitors. There are a wide variety of restuarants nearby and supermarkets round the corner. We had a lovely Christmas and would strongly recommend this apartment for a York stay at any time of the year. We loved our short stay here and would recommend this apartment to our friends and relatives in both England and Canada. This review was posted on behalf of Canadian relatives who stayed at the apartment and gave me their comments to post. Fantastic location right in the centre of York, easy walk to all the shops, restaurants & amenities. Great to have free secure parking, the lift access was useful. The apartment had everything you needed and the welcome pack was very good. Thank you for your positive review. We are delighted you enjoyed your stay in our apartment. We did try three times to contact you on the apartment telephone to check that all was well, but we never caught up with you. We slipped up here and should have used your mobile. Apologies. 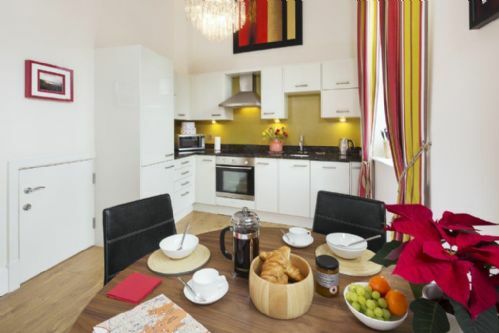 Super apartment situated in the heart of York. Comfortable and well equipped. Nice place to chill out. Thank you for your review. Chilling out in the centre of York is what our breaks are all about! Perfect location, apartment has everything you could want or need for your stay and so close to the city centre, an absolute gem. My wife and I have stayed in this property each of the last five Septembers, the years before this under different owners. It was fantastic in every respect with them and I am happy to report it is equally fantastic with the Field House Farm folks. This apartment is modern, spacious, with great natural light and ventilation, soaring high ceilings, well appointed and with every appliance you could possibly want. The location is out of this world--inside the York city walls, a two-minute walk from The Minster, all the fun York streets and shops right at hand, and yet on a quiet, residential street. Plus, the wonderful Goji Vegetarian restaurant is a stone's throw away. How you can beat all of that, I know not. The owners, Angela, John and James, were all friendly, extremely helpful and accommodating, and immediately responded to the only problem we encountered during our stay (the internet was balky on our arrival and they had someone out to fix it in the blink of an eye). We have been in York every September since 1996 and have stayed in three or four 5 star self--catering properties over all those years. This one though takes the top prize and we wouldn't even consider looking for something else. As I said in the title of this review--it is a total winner. What can I say? I'm overwhelmed by your ringing endorsement of our apartments . Thank you so much. We look forward to your next stay in September 2019. We thoroughly enjoyed our stay at the Brew House. Booking was easy, the owners were friendly and helpful, the apartment was clean, comfortable and stylish, and the location peaceful yet very central (just a stone’s throw from the Minster - maybe that should be a “scone’s throw” - Crumb’s Cupcakery just around the corner has amazing scones!) The welcome hamper was excellent, right down to the milk in the fridge so that the holiday could begin with a good Yorkshire brew! There’s loads to do in York, and all easily accessible on foot from the Brew House. There are also public transport links reasonably nearby. Oh, and I must mention that there were some excellent street performers around the city when we visited in August. Have never thought of ourselves as a 'scone's throw' but love the idea! Anything to do with cakes has our family hooked. So glad you enjoyed your stay in The Brew House and hope you will return. The Brew House is ideally located close to the Minster and is so peaceful and quiet. The apartment is spacious and comfortable with everything provided that you would need for a short break. It is exceptionally clean and the owners provide a lovely welcome basket for guests. Thank you for your lovely review. We think our three apartments in York are fabulous and it's great to know our guests do too! The apartement was very luxurious, we found everything we needed. It was very quiet although it was in the middle of the city. We only can recommend this apartement. A really comfortable stay during a busy and very hot week in York. Howm from home on my return from the many concerts I was working at. Thank you, Angela and John! We're so glad you enjoyed your stay Anni. From what you say you had a very busy time. I hope you managed a little rest too. I had a glorious midweek break right in the heart of the City under the Cathedral towers. The apartment is superb in every respect with gated parking and a lift if you don’t fancy the stairs. The location is very peaceful and quiet despite being in the middle of a bustling city. The hospitality and customer service is great and the welcoming box of goodies is a real treat, I am still nibbling away at the peanut butter chocolate shards as I write.I have also stayed in the Malt house and Hop Store and they were superb as well, so I will keep coming back for more. 10/10 Excellent. Thank you for giving us 10/10 Excellent. I'm so sorry I have taken so long to reply. I thought I was keeping up with all our reviews, but a quick glance through this morning has shown me I have missed reolying to several like yourself. Apologies. John and Pam from Basingstoke. we have used the flat for several years and have never found any reason to complain about it. It is in a great location,so close to the Minster and centre of the city yet quiet. This time it was not quite up to the standard we have been used to. Thre was a drainy smell which the owners' acknowledge, the ledges were dusty in parts and one of the face cloths was dirty. We raised these points with owners and they promised to deal with them. We expect to return. Dear John and Pam Thanks for posting your valuable feedback after your stay at The Brew House. I'm sorry that, on this occasion,we were found wanting. We are on a bit of a learning curve with the acquisition of a third apartment. We need to learn how much time it takes to turn it around and learn about any unique peculiarities. Thanks to you, we now know that the water barrier in the 'u' bend of the washing machine is prone to evaporate and allow vapours to creep into the hallway. We now put the washing machine on to a rinse cycle when we change the apartment and this should keep the barrier intact. You also found a used flannel after a guest had, rather bizarrely, after using it, rolled it up and placed it back with the clean flannel making them both look unused. Changing all towels regardless is our normal policy but on this particular changeover the girls had left the Brew House until last and, under a lot of time pressure, found that it needed a great deal of work. I suspect that, given that they were running out of time, they left the flannels alone because they looked unused. We now know to allow more time to properly cover that apartment and so if you do, hopefully, return you will find it back to the standard that you expect. The apartment is beautifully decorated and very comfortable with everything you could possibly need for a short break. It is very centrally situated just a few steps from York Minster but is in such a quiet position that a good night's sleep is guaranteed. We loved it and are returning again in July. We had lovely sunny weather and a recommendation is to enjoy a drink in the garden of Grays Court Hotel which is located just around the corner from The Brew House - also walk the city walls for great views that you wouldn't usually see from strolling the streets. Sunday lunch at The Guy Fawkes Inn is also recommended. I can't recommend the apartment more highly - the best that we have stayed in at York. The Brew House is a perfect place for a stay in beautiful York. It is centrally situated, near the Minster, with designated parking space. It’s only a short walk to the shops and many places of interest so the car can stay where it is. The Brew House is extremely comfortable and very well equipped with thoughtful attention to detail. We enjoyed our stay - thank you. Thank you for a really lovely review. Lovely, comfortable flat in a great location. Lovely flat, very comfy, clean & warm in a great location, with parking. Fantastic welcome pack & very helpful owner. We're delighted you enjoyed your stay with us.